MTN is has come up with another offer to make their costumers happy by introducing a welcome back offer which gives you 1GB for N200. 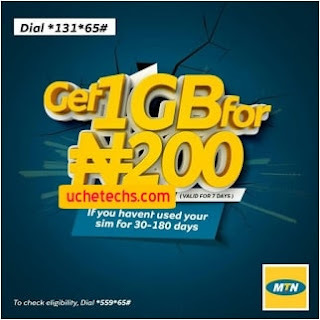 This MTN Data promo was introduced officially on their social media pages, and they indicated you can get MTN IGB for N200 which can be used within 7 days ( 1 week ). As you can see, only MTN sim card that hasn't been used for 30 Days can enjoy the 1GB for N200 Promo. New Sim cannot get this offer but existing MTN Sim that hasn't be touched or let's say abandoned for 1 month. This plan is similar to 9mobile 1GB for N200 which lasts for 3 Days but works on new and existing Sims. Be sure to check it out. Simply get an MTN Sim that you haven't used for more than 1 Month. Enjoy, tell me what you think guys.